I’m just going to say it up front, instead of making you read the entire review to get to the possible juicy parts: I did not enjoy this book at any point while I was reading it. The rest of my review is going to focus on why. I think betrayed promises are one of the reasons I disliked Ancillary Sword the entire time. The first novel in the trilogy, Ancillary Justice was solid, epic, and rather enjoyable. It won basically every award on the planet, and even if it didn’t completely thrill me, I can understand why it garnered at least some of the acclaim that it did. It was the story of a ship made into a person, the losses and changes she had to go through, and also the story of a splintered empire, ruled by an empress with multiple personality disorder. I expected the sequel to either be more of the same, or to expand into something even more epic—that’s what a trilogy promises to me. Spoiler warning for Ancillary Sword. Do not read past this point if you do not want a handful of plot points spoiled for you. I feel that I simply have to talk about them to properly express why I disliked this book. The story followed Breq into a single solar system, and focused completely on her present-day life. As much as I found the flashback sequences in Ancillary Justice confusing, they offered glimpses of a major, planetary-wide conflict, as well as an intriguing view into what it meant for Breq to be an entire ship. None of that here, so there is nothing to detract from the present-day monotony of Breq’s life. The only glimpses that we get of her previous life as a ship are her moping about no longer having that power as she watches her own ship go about its duties. Ancillary Justice ended on a tense note with the Anaander Mianaai plot, and I expected more of that here. Nope. Except for the thing in the first handful of pages, Breq is almost entirely shut-off from the galaxy outside her single solar system, and there are no copies of Anaander there for her deal with, so that plot does not get advanced—or ever brought up—much at all. I think this was honestly the biggest disappointment; Ancillary Sword was epic in scope, Ancillary Sword was not. It was also boring as heck. More than half of the novel felt like it was spent drinking tea or thinking about tea and teacups. When I want to read about epic interplanetary space battles with immortal empresses and sentient ships, drinking tea on a space station, then drinking tea on a planet, then going and drinking tea again on the space station just doesn’t cut it for me. All in all, I felt that Ancillary Sword could have been cut almost completely from the overall plot of the trilogy, and not much would have been missed, either in the way of worldbuilding or character development. Or action. Or the plot. I am not intending to subject myself to this again and try to read Ancillary Mercy unless it is required by the Hugo Awards next year. (I will read all nominees and give them a fair chance.) 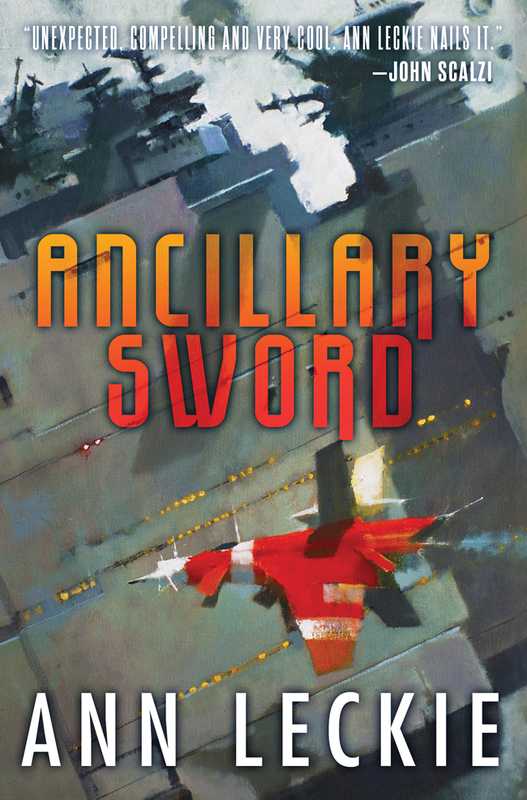 While Ancillary Sword did nothing majorly offensive or actively bad—the writing was at least competent—it did nothing to interest me either, and on the heels of Ancillary Justice, I was completely let down and did not enjoy it at all. In summary, Ancillary Sword was a bunch of people drinking tea while hardly even contemplating the galaxy-shaking plots that must have been going on somewhere, leading to a boring, disappointing follow-up to an enjoyable first novel. I wouldn’t go so far as to say that I hated it, but I strongly disliked it, and felt that it had no place on this year’s award ballot. I give it two of five stars, sadly (I want to like the books I read! ), and do not intend to continue with the series.